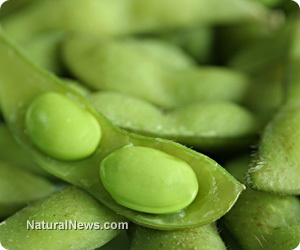 (NaturalNews) There are three major types of peas - garden peas, snow peas and snap peas. When Gregor Johann Mendel, an Austrian monk and botanist, cross-bred two different types of peas, he found that the "child" had the characteristics of both "parents". The discovery that physical traits are passed from generation to generation laid the foundation for modern genetics. Today, close to 80 percent of the world's pea crop is used dried as supposed to fresh; in the US, however, 90 percent of the peas are actually consumed as fresh green peas. Here is a brief rundown of some of the health benefits of peas. Peas contain the green pigment chlorophyllin, a substance related to chlorophyll whose molecular shape enables it to combine with cancer-causing chemicals in the body. According to Mary Ellen Camire, PhD, a professor in the department of food science and human nutrition at the University of Maine in Orono, "when you eat peas, the chlorophyllin attaches to carcinogens and helps prevent them from being absorbed." Other green vegetables also contain chlorophyllin. The greener, the better. Peas are good sources of fiber, containing over 4g in every half-cup serving. And sufficient fiber intake is not only crucial for good digestive and intestinal health, it also helps lower one's risk of many chronic diseases. The soluble dietary fiber contained in peas also helps to keep one's blood sugar levels steady. In addition, the fiber in peas helps to reduce cholesterol levels in the body, which in turn lowers one's risk of heart disease. Furthermore, research has found that consuming peas can lower triglyceride levels too, again offering protective benefits against heart disease. For example, a Danish study found that people who added small amounts of pea fiber to their regular diets experienced an almost 13 percent drop in total triglyceride levels within a fortnight. Peas also contain good amounts of folate and vitamin B6. These nutrients help the body to keep homocysteine levels in check, which is useful for cardiovascular health because high homocysteine levels are linked to high risks of heart disease and stroke. Half a cup of green peas has more than 11mg of vitamin C, a vitamin which contributes to human health in many ways, including fighting colds, lowering cancer risk and boosting immunity. Another vitamin which peas provide an abundance of is vitamin K. This vitamin plays a role in blood clotting as well as having strong bones. Peas are a good source of protein. According to experts at the Mayo Clinic, a half-cup of peas has as much protein as one tablespoon of peanut butter, without the fat the latter also contains. Peas contain numerous essential minerals as well, including manganese, magnesium, iron, phosphorous and potassium. One point to note is that while green (fresh) peas are a good source of vitamins C and K as well as carotenes, dried peas actually contain very little of them. Furthermore, due to their lower water content, dried peas contain a higher proportion of calories than fresh green peas. Thus, broadly speaking, fresh peas would provide better nutrition than dried ones. Go for the greenest peas, and avoid darkened pods as well as those which look pale or are dotted with mildew specks. Water-soaked peas would not taste very good. Dr. Camire also suggested that a half-cup of shelled peas would provide better nutritional value than an equal amount of podded peas, as the peas themselves actually contain most of the fiber, niacin, phosphorus, thiamin, vitamin A, riboflavin and folate found in the food.